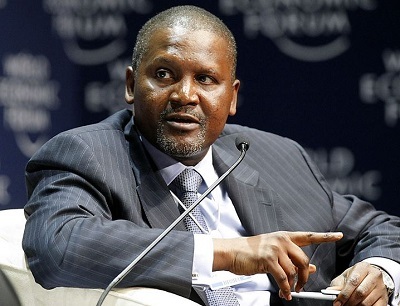 The Chairman of Dangote Group of Companies, Alhaji Aliko Dangote, on Tuesday, revealed that his organisation would create 210,000 jobs for unemployed Nigerians between now and 2018. Speaking in a goodwill message at the opening of Katsina Economic and Investment Summit themed "Unlocking Investment Potentials for Sustainable Development", the Chairman of Dangote Group of Companies, Alhaji Aliko Dangote on Tuesday, said that his organisation would create 210,000 jobs for unemployed Nigerians between now and 2018. The Africa's richest man who disclosed that 80 percent of the jobs would be in the agricultural sector, said; "We will create 210,000 jobs between now and 2018 with 80 percent coming from the agricultural sector. So, we should pay attention to the agricultural sector for investment opportunities, particularly when the crude oil is now becoming unreliable." The billionaire magnate also said that agriculture is a lifetime opportunity for Nigerians, adding that Brazil, which had same peculiarities with Nigeria, had $350 billion in its foreign reserves, with 80 percent of the fund attributed agriculture. "I think it’s a lifetime opportunity which God has given to us by repositioning things while oil has gone down. It is not a curse, it is for us to diversify the economy. We have been relying on oil and I think oil very unreliable. "When you look at it, despite the downturn of various economic activities in the whole world, the only things that have actually not gone down are agricultural products. Rice, wheat, sugar have not gone down in price, so we should make sure that we use this opportunity which God has given us – arable land. "Both us and Brazil, we have the same quality of land and Brazil today are number one in sugar, soybean, poultry and in a lot of things. So I think we should copy that," he said. Dangote also said that he would establish the largest single refinery in the country with the capacity to produce 650,000 barrels per day and two sub-sea pipelines of 550 kilometers in Delta, Ogun and Lagos, adding that he would assist government to reduce pipeline vandalism as well as provide 12,000MW of power. He called for the creation of enabling environment for investors by identifying areas with comparative advantages. "You don’t need to call for investors, just create enabling environment for the local ones, you will see the foreign ones gate crashing," he said.